Cookies have been one of my biggest challenges since I started a gluten and sugar free diet. Cakey cookies are usually no problem, but crunchy, crispy, or chewy cookies? It just hasn’t been easy for me to replicate these textures with the ingredients that I use. I’m sure it’s down to chemical makeup and reaction or non-reaction, which I’m certainly finding out more about as I go along, but I’m no expert … yet. However, I am starting to get better cookie results, so I guess I must be learning something. Or it’s dumb luck. Either way, I’ll take it. My gluten and sugar free take on one of my favorites, thumbprint cookies, comes pretty darn close to the “real” thing. 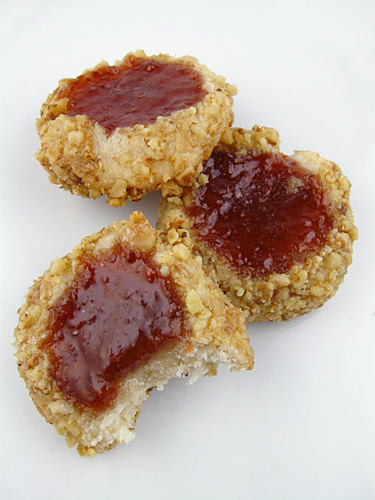 I’ve always enjoyed the balance of the subtly sweet, shortbread-like cookie, covered in toasted walnuts, with a sweet burst of jam in the center. My favorite jams to use are raspberry and strawberry, and I’ve also seen them with chocolate frosting or ganache in the center. Notes: Instead of chopping the walnuts with a knife, I place them into a zip top bag and use a can of something from the pantry or a rolling pin to crush them into small pieces. 1. Preheat oven to 350 degrees F. Line two cookie sheets with parchment paper and set aside. 2. In a small bowl, combine the gluten free flour blend, xanthan gum, and salt. Stir with a fork until combined. 3. In the bowl of a stand mixer, or in a large mixing bowl with a hand held mixer, beat the butter and xylitol until light and fluffy. Add vanilla extract and beat until thoroughly incorporated. Add the dry ingredients, one third at a time, and beat on low until incorporated. Cover and chill dough for up to 1 hour. 4. Separate the egg, placing the egg white into a small bowl and whisking until frothy. Place the chopped nuts into a separate bowl. 5. Roll chilled dough into 1 inch round balls. Roll the dough balls in the egg white until thoroughly covered. Shake off any excess, and roll the dough balls in the chopped walnuts until covered. Place onto a cookie sheet and, using your thumb, gently press down on the center of the dough ball until an indentation is formed. If the dough cracks around the edges, reshape until rounded. Place approximately 1 teaspoon of jam into the indentation. 6. Bake for 12-15 minutes, until golden brown on the bottom. Cool and serve.